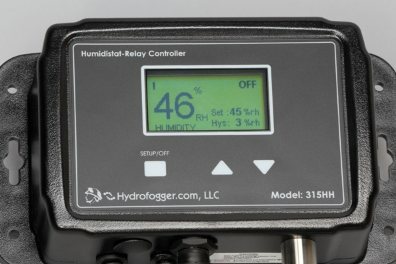 Highly accurate humidity control.� Measurement range from 0-99% rH. Large Graphic Display showing humidity and set points. Swiss-Made humidity sensor with extraordinary performance. User friendly setup with push buttons on the front panel. Ideal for applications requiring precise humidity control. Accurate to +/-3%. No wiring necessary-simply plug any of our foggers into the separate power module and that's all there is to it! Shipping & Handling is free when ordered with any of our humidifiers.